Smart Homes: Is The Dream Achievable? The market-place for smart technology is always open and expanding, with more consumers wanting to implement the Internet of Things (IOT) into their everyday lifestyle. Smart products bring in an appeal of simplicity and convenience to modern lifestyles, be it controlling your washing machine remotely from your mobile phone, or simply being able to dim and alter the brightness of your home lighting from the comfort of your sofa. More than ever, there is a craving to achieve a completely functioning and simplistic smart home. With UK homeowners spending £27 billion each year on home improvements, it is hardly surprising that these improvements are becoming more digital and gadget orientated, with even the most trivial home equipment, such as light bulbs, falling under the control of the homeowner’s smartphone device. To put into perspective the breadth of smart home products, technology company Moley has developed a fully functioning robotic chef arm, which provides motion-tracking to completely replicate the moves to complete any dish. The product is set to release in 2017, and will feature sophisticated levels of functionality that the consumer can access all via a smartphone device. The idea of implementing robotic arms and devices is completely feasible, however this engineering will undoubtedly remain expensive and impractical for the standardised home. There are a range of easily sourced and affordable adaptations to create a smart home, although the market is so wide, 40% of homeowners don’t know where to begin when it comes to understanding the notion of the smart home and the Internet of Things. Although there is clear demand, with over 86% of homeowners saying they would consider a smart home, a fully kitted out smart home is unlikely to appear on our property markets anytime soon, simply due to the cost factor and reliability of technologies as it stands. The majority of homeowners are satisfying their need for technology-savvy homes by purchasing affordable smart home add-ons from high street retailers. John Lewis has an entire sub-section of its website dedicated to smart home products, provided by leading retailers such as Samsung, Panasonic and Philips. Household brands are distributing smart home products, and it is becoming more practical to be able to purchase a television and smartphone controlled lighting in the same basket. Along with home accessories, even staple household products such as the kitchen refrigerator are getting a smart makeover. Samsung has ambitiously developed the smart fridge, retailing at around $5,600. This fridge goes further than just being aesthetically pleasing, centering around family friendly applications that are responsive on the fridge’s exterior. 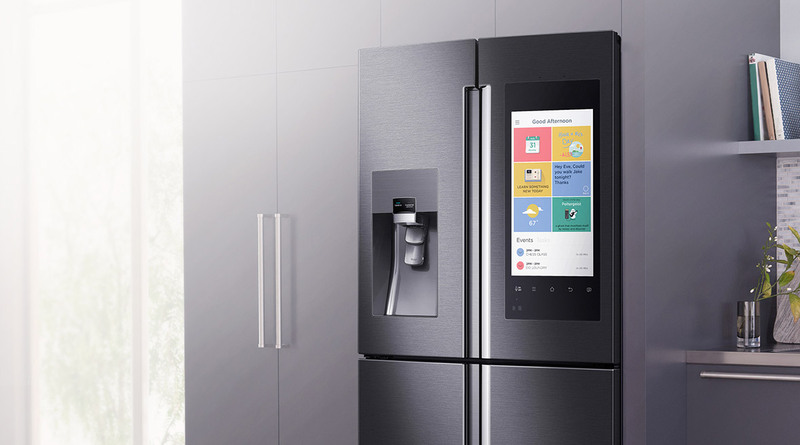 Consisting of a calendar, notepad and photos – just to divulge a few of its capabilities – the Samsung smart fridge is a radical upgrade from simple magnets and sticky notes. Inside the fridge, Samsung has implemented a camera. The smart fridge couples with a Samsung mobile app, allowing users to easily check on ingredients when away from the home. This is a momentous investment for a product that solves some inconvenient issues, and the tech-friendly fridge retails at thousands more than existing Samsung fridges that don’t boast the add-ons of cameras and touch-screen doors. If modernised smart homes want to encompass every aspect of the home, kitchen appliances will certainly come at a premium. With price being the main drawback, it is unsurprising that homeowners have taken it upon themselves to take a DIY attitude to making their home more “smart”. It has been predicted that by 2022 the typical home could contain over 500 individual smart devices, which furthermore emphasises that a complete reconfiguration of our housing market is extremely unlikely and instead, it will be a case of homeowners purchasing smart home products themselves on an individual product-by-product basis. A completely self-installed smart home is likely to pose its own issues, though. The installation and configuration of smart technology products is unlikely to become any simpler, and installing electronical products of course comes with risks. 74% of home installers state that they’d like to become competent with installing smart homes, however this is of a considerable cost to the employer to provide the relevant education; costing the building and installation industry. Furthermore, creating unison with smart-devices can often be quite difficult. Despite being connected through the same devices or internet connection, this does not necessarily suggest the smart home products will work in a harmonised manner. Each smart home device comes with its own application and communication protocol – meaning they function individually. There are currently ongoing efforts in place to try and bring in synchronising for smart home products, although this hurdle is likely to be a case of trial and error, especially as the demand for smart homes becomes greater and the number of product launches increases rapidly. John Naughton, columnist for The Guardian and professor of public understanding of technology at The Open University, posed the question of whether the public should be worried if their homes will soon become “smarter than they are.” Director of National Intelligence, John Clapper, made it clear that many devices that are increasingly becoming linked to home internet connections are providing an ample opportunity for intelligence agencies to monitor and track not only specific targets, but also the masses of the general public. This is of course an extreme speculation made by Clapper, yet there is an underlying concern that bringing more and more comprehensive internet-based technology into our home can pose as a security risk for our personal data and information. There are undoubtedly benefits of having a smart home. The lives of the modern generation are becoming more tech-heavy and simplistic thanks to ever-advancing technologies, so it is a fair assumption that these technologies will soon play an ample part in home life. The ease of smart homes could also considerably help homeowners with disabilities or other health issues, which can make tasks normally considered quite simple – such as getting up and changing the heating – a difficult and strenuous task. Smart homes give that capability to resolve modern day niggles most homeowners suffer, and give them the ability to confidently control the logistics of their home from wherever their location. Smart home products will undoubtedly continue to crop up on the shelves of household retailers, and with many ambitious products in prototype stage at the moment, it’s difficult to speculate what household item will be next to receive a smart upgrade – especially as Bluetooth toothbrushes, smart toilet seats and auto-watering plant pots are already in the mix. Despite the clear positives the smart home provides, there are a number of clear obstacles that need to be overcome before smart homes can be rolled out to the public housing market. Affordability, practicality and safety all need to be considered very carefully. The dream of living in a completely smart home is certainly achievable, however in the immediate future it can be expected that smart home living may be more expensive, less-fluent and pose more concerns than originally anticipated. Are you considering a smart home? Do you believe that the complete smart home is achievable? Let us know your thoughts and concerns below, and don’t forget to subscribe to our blog to have stories straight into your inbox.